HUAWEI moves up on Forbes Most Valuable Brands of 2018 as China’s only company to feature in the global ranking. HUAWEI is the only Chinese company to feature in the annual ranking of the world’s Most Valuable Brands 2018 compiled by Forbes. 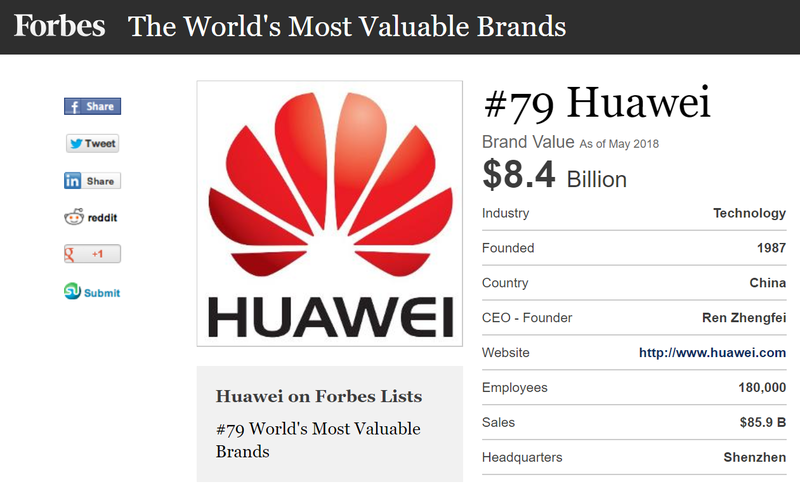 HUAWEI has been included in the list for the second consecutive year ranking 79th with a brand value of US$8.4 billion. HUAWEI entered the list for the first time in 2017 and ranked 88th with a brand value of US$7.3 billion. After a year of rapid development, HUAWEI’s brand value increased by 15% year-on-year to US$8.4 billion, and its ranking went from 88th to 79th. Technology companies continue to dominate the list by taking the top 5 spots and accounting for up to 20% of the TOP100. Apple came No. 1 for the eighth straight year, followed by Google, Microsoft, Facebook and Amazon. The TOP100 brands have come from 16 countries and regions in the world, with the largest number from the U.S. taking 54 places, followed by 12 brands from Germany and 7 brands from Japan and France respectively. HUAWEI is still the only Chinese brand on the list. 2017 saw HUAWEI achieve a rapid global development driven by the full range of its products featuring the Mate, P and Nova series. The launch of the HUAWEI P10 and HUAWEI Mate10 series helped to raise its premium credentials and increased HUAWEI’s influence in the high-end market. HUAWEI nova 2s in turn won acclaim among younger generation for its focus on the latest fashion consumer trends. HUAWEI officially launched HUAWEI P20 series in Paris in March, 2018. With its unique and innovative Leica Triple Camera, twilight body design and AI features, HUAWEI P20 series has been a global sales sensation. 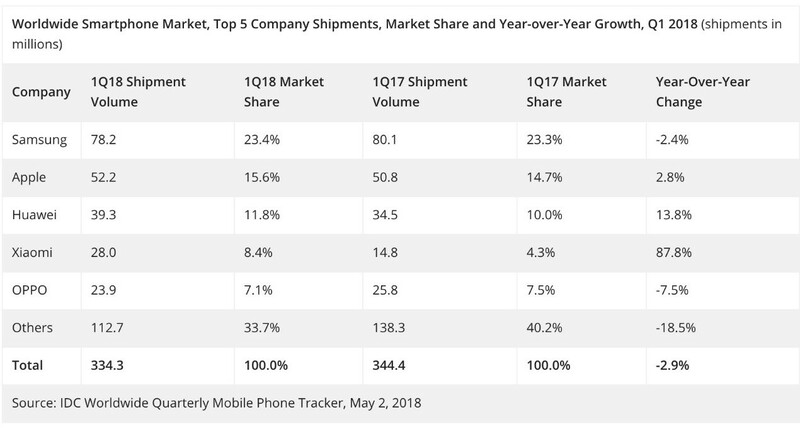 According to IDC, HUAWEI’s market share has increased by 13.8% to 11.7%., and ranked third in the world in Q1, 2018. HUAWEI’s global brand awareness went up to 85% in 2017 whilst consideration of HUAWEI’s brands among overseas consumers has gone up significantly, with a year-on-year surge of 100%. According to the IPSOS, HUAWEI's brand awareness, consideration, and NPS rank No.1 in the Chinese market. Meanwhile, HUAWEI also performed well in other major global brand rankings. 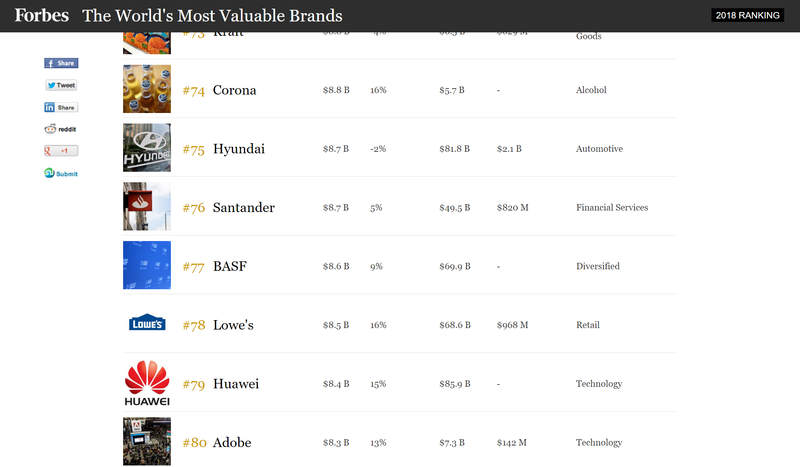 HUAWEI ranked 70th in Interbrand’s “TOP100” most valuable brands released in September 2017, and in February 2018, Brand Finance unveiled the “Global TOP 500 Brand Values in 2018” report ranking HUAWEI at No. 25 with a brand value of US$38 billion. In terms of patents, as of December 31, 2017, HUAWEI accumulatively granted 74307 patents, applied for 64091 Chinese patents, and accumulated 48758 foreign patent applications, of which more than 90% were invention patents.